Sign Design Vinyl cut signs are used for small, medium and big businesses for their needs. We manufacture signs, letters and logos according to your design and specifications. We make Office Signs, Factory Signs, Restaurant Signs, Bank Signs, School / College Signs and more. We manufacture custom signs as per your requirement, Indoor Signs, Outdoor Signs could be made in reflective and non-reflective vinyl. We provide Acrylic Signs, Fiber Signs, Wood Signs, Stainless Steel Signs, Alucobond (ACM) sheet Signs, LED 2D/3D Signs & MS Signs. which we sell to our customers located in Karachi, Lahore, Hyderabad, Sukkur, Quetta, Rawalpindi, Multan, Rahim yar khan, Bahawalpur, Faisalabad, Islamabad and throughout Pakistan. Given the stiff competition that is found these days, it is rather important to give adequate attention to marketing. You need to make sure that you leave a significant impact on your potential clients to the extent that they would think about your company when they contemplate acquiring a service that you offer. If you are looking to make sure that your marketing strategy is optimally effective and does not make your budget go through the roof, get creative signage for your company that would provide you with the results that you are looking for. When you step out on the road, you find a lot of signs in Karachi. Amidst these signs, making a mark with your signage could be quite troublesome since there are chances that your sign would go unnoticed, thereby leading to the failure of the attempt to generate attention. 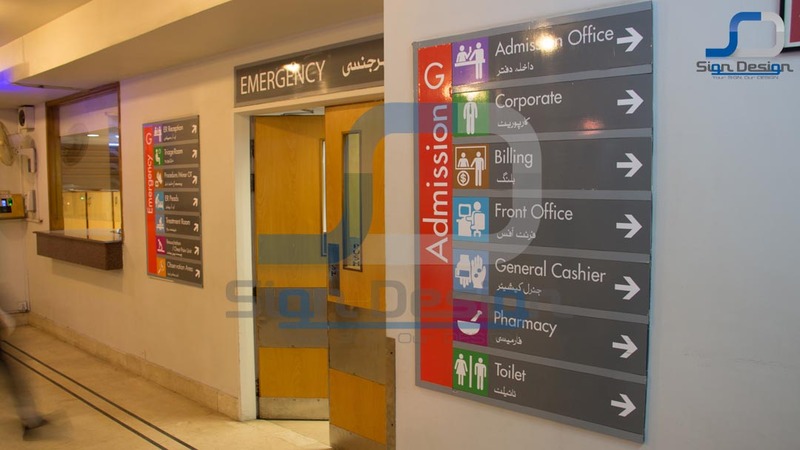 Thus, you need to think out of the box, which is why it is 3D signage in Karachi which you will find to be a reliable option. This is because 3D signage is capable of attracting attention. It manages to stand out among the other signs and force people to take notice. If you want to acquire maximum benefits that signs have to offer, it is important that you bring a suitable signage company on board. You need to opt for someone who understands the pulse of the audience that you intend to target. They need to be aware of what appeals to people and then develop a sign for your company brand accordingly. In that matter, you can place your trust in us as we will make sure that you are provided with signage that provides your business the boost that it requires and serves to market it with effectiveness. The reason why you can trust us to provide you with innovative and impressive signs is that we are aware of the importance of this job. We understand that the first impression can make or break the business. A lot of potential clients might be attracted to your business solely because of the sign while others might avoid it owing to the same. Thus, with 3D signs and indoor signs you can make sure that you make your first impression very good on your potential clients. People tend to be of the opinion that 3D signs are suitable for exterior only. However, the thing about 3D signs is that they are rather stylish. Therefore, if you are looking for some indoor signs, you will find the 3D signs we produce to be a good option. We extend our services in Karachi for various applications. It does not matter if you are looking for a banner to promote a new service or if you want some lobby signs that would let people know some basic information about your company. You can be certain that we will provide you with a design that will suit your requirements to the letter. We endeavor to make sure that all your requirements are catered to. We understand the requirements that different signs have. For instance, if we talk about monument signs, they have a different objective while retail store signs are meant to provide you with a different effect. Thus, both the signs cannot be made in the same manner, and there needs to be a significant difference in the design between the two. Similarly, if you want to put up a warning sign, your primary objective would be to ensure that the sign garners attention and spreads the message that you want to be made public. On the other hand, factory signs and bank signs are meant to make it easier for the customers to find their way around the area. Traffic signs are supposed to make it certain that people do not end up forgetting the rules and jeopardize their safety and that of others. The health and safety signs ensure that you spread awareness with regards to diseases and what can be done to maintain optimal health. The fire safety signs serve the purpose of spreading information regarding the precautions that need to be taken to avoid starting a fire accidentally. With construction signs, people are alerted that work is in progress in the area and thus they need to be cautious. Architectural signs once again are meant to bring the attention of people. Signs can also be used to provide instructions and guidance to the people. People often tend to think that signs are meant for outdoor purposes only to garner attention. While there’s no denying that this is indeed one of the essential functions of signs, this is not all that they have to offer. You can also put up signs for your office and factory to make things safer and feasible for everybody involved. You can let people know the precautions that they need to take to avoid accidents and the measures that should be taken in case of emergencies. Thus, there are different functions that are performed via different signs and all need to be designed differently. Health and safety sign does not have any kind of decoration or out of the way creativity that is actually a part of a banner meant to market a business. When you bring us onboard, we make sure that we understand what you are looking for and then work to fulfill your requirement to the letter. Problems often arise when people fail to communicate properly. This is not a problem that you will have to face with us. This is because we endeavor to make sure that we hear everything that you have to say and then incorporate your ideas and requirements into the design that we produce. You can also contact us if you want custom letters and signs. All that you need to do is provide us with specifications and the results that you are looking for, and we will make sure that you get just what you need. It is often said that prior to acquiring any service, you need to make sure that the company you bring onboard is capable of handling the job. This is not something that you need to worry about when it comes to dealing with us. You will find that we are professionals in our conduct and do not compromise on quality service that we provide. We have been providing branding services in Pakistan for a long time and our signs are scattered all over the place. Moreover, we have satisfied all our clients with our services and thus it is highly unlikely that you get a negative feedback when you endeavor to find out more about us. To make sure that you get the best possible quality, we make use of the cutting-edge technology to produce the final product. Whether it is fabric laser cutting, raw silk cutting, or raw silk laser cutting, you can be certain that everything will be taken care of in the best possible way. The scale of the business is irrelevant to us. It does not matter to us if the office signs we prepare belong to a small business or a large one. We approach each task at hand with the same level of professionalism and efficiency. Therefore, you do not have to face any inhibitions when contacting us. As mentioned prior, we offer a lot of variations. Therefore, you can get vinyl signs and stainless steel signs from us. We also make use of radium material in our emergency signs which glow during the dark. Thus, you will get something that suits your needs and meets your expectations, sometimes exceeding it as well. Our services can be availed in Karachi. Thus, if you want to make sure that you attain a profound quality sign that caters to your requirement and also manages to grab attention, you can place your faith in us. We abide by all the rules that need to be followed while manufacturing the signs and thus this is not something that you will have to worry about. You can be certain that with our assistance, your brand quality will increase to a great extent. The thing about designing a sign is that it cannot be handled by anyone. You can only expect an amateur to provide you with quality results. This is something that requires knowledge and experience. You need to understand what would appeal to people and what would put them off. You need to have brilliance and dedication to make sure that you are able to make a sign that would not only fulfill the requirement of the client but would also have a significant impact on its marketing and popularity. We understand all this which is why we make only those people a part of our team who are serious about the job and qualified to handle the requirements. We have designers who are aware of what clicks with people and what the rules are that need to be followed. Our job does not just end with designing a sign. We also perform the task of fabrication, following which we also install the sign. Thus, once you bring us on board, you can put all your worries to rest as we take care of everything. We also understand that the budget needs to be limited in the manufacturing of these signs. Thus, we provide you with affordable rates for our services and that too without making any compromises on quality. Therefore, you can acquire our services to get the banners, signs, letters, and logos that you need with ease of mind without having to worry about anything. Once you bring us on board, you hand us all your inhibitions and worries, and we make sure you’re your banners and signs are not among the things that you need to keep an eye on. At the end of the day, the whole purpose of getting signs and banners is to leave a good impression on your client. We make use of various shapes, sizes, colors, and styles to provide you with an innovative sign that would not fail to grab attention. Our signs have that well-finished touch which would make sure that your client gets a favorable impression of your company. We have the recipe and the ingredients to make a perfect sign that would promote your brand effectively, and you can be sure that you will not be let down when you see the final product. The thing about getting a sign is that you first need to acquire some information with regards to the options that you have. For instance, you can get custom 3D letters that add a new dimension to the designing of the sign. You can also opt for 3D logos for your indoor signs to make it all the more impactful. Quite often, it is seen that people are not aware of the options that they have when it comes to signs. Do not worry if you are one of them. You can check out our portfolio to acquire more information about the signs that you can have. You will be given more options which will make it easier for you to find something that would suit your taste and preference. While deciding upon the design that you want for your sign, you need to put yourself in the shoes of your targeted audience. You need to think from their perspective. Try to focus on how the signs would appear to them and how they would react to it. You need to think how your business would be perceived by your clients and whether they would be willing to give you a chance. If your sign reeks of negligence, it will send the message to your clients that you do not pay much attention to your business, thereby forcing them to look at other options. Similarly, if you have a sign that is optimal in terms of quality and originality, and is creative, your clients would get the message that you pay a significant amount of attention to every aspect associated with your business. We endeavor to make sure that the needs of your business are met. Thus, we approach each task with a different mindset and individuality to make it certain that you get something that is a reflection of your business. Making signs is not a one-man show. It involves a whole team that brainstorms ideas and exchanges thoughts to come up with something perfect. This is where you will find that our team excels in. Our team pays meticulous attention to detail. You will not be kept in the dark with regards to the progress of the work as we will provide you with a demo that will let you get a rough idea of how your design would look like. This will make sure that you are up to date with the work that we do and can suggest changes if required. It is important to get the right color combination and techniques while developing signage to make sure that emphasis is made on important parts of the design. Furthermore, it is of equal importance that the best materials are used for the signage. This needs attention because an outdoor sign tends to be at the receiving end of quite a bit of rough conditions, and thus durability is a feature that needs to be offered. You can be certain that we do not make any compromises in this regard. It is important to make the clients realize that they are dealing with a tasteful company and this is where a sign can do wonders. Therefore, when it comes to making a good impression on your clients, there is nothing that you will find more effective that a suitable sign. Another important thing to keep in mind is that once you surf in your time and effort to get a good sign for your company and have it installed, there is not much that you will need to do then. The signs will take care of the rest. Thus, signs and logos make for a very cost effective marketing strategy. Most orders are shipped within two to four days, depends on work load. Clean edges, sharp inside corners, no bubbles and not scratch marks. Optional installation template with exact letter spacing can be added with nomimal charges. Optional hardware can be added to the back of letters with nomimal charges. It is apparent that 3D signage has a lot to offer and thus you need to make the most of it. For this, getting the right people on board is important so that your sign does not end up being one of the many that are found on the roads of Karachi. When it comes to running a business, it is important that you do not leave out any detail. It is always the little things that matter. The competition is at an all-time high these days, and thus it would not take long for some other company to replace you if you are not cautious. Therefore, you need to ensure that no detail escapes your attention. Make sure that you take all the measures that are required to market your business in the best possible way. People these days hardly have time to notice signs as they hustle around to reach to their destination. Therefore, there needs to be something in your sign that would grab their attention and force them to take notice. This is something that we can help you with. Thus, allow us to make sure that you do not end up losing out on potential clients. You will not have to worry about the signs appearing old or worn out within a short span if you acquire our service. You can also be certain that the sign would be able to stand the test of time. All in all, we endeavor to make sure that you get a profound quality service that will leave you satisfied. Hiring us would not be a decision that you will have to regret later as we make sure that you do not have to look for another signage company ever. SignDesign is a place that insures that you get quality results that exceed your expectations and get you more than you anticipated. Thus, do not delay things any longer and contact us to provide you with a sign that will give a significant boost to your business and prove to be beneficial in attracting potential clients. All you need to do is just send us the type of signage that you are looking for along with other details and requirements that you have. We will then let you know the budget that would be required for the task. Once you approve the deal, we will provide you with a preview free of cost, following which we will proceed to the next level. Therefore, you do not have to worry about anything while dealing with us. We endeavor to make sure that all our dealings are transparent so that you are not taken by surprise. A variety of materials can be combined for all your sign needs as mentioned above acrylic is a versatile material for making signs then comes Alucobond. Whether you are a sign professional or a do-it-yourselfer, you will find that you can build your signs easily and hassle-free with our friendly services. If you install the signs yourself, we can help you save time and money. Optional installation template can be included and shipped with your order showing exact spacing as in the file. Signs and logos, that usually take hours to install, can be done in minutes. We also offer custom fabrication and installation guides to help you with your sign project. For free estimates, email us your artwork with your specifications.